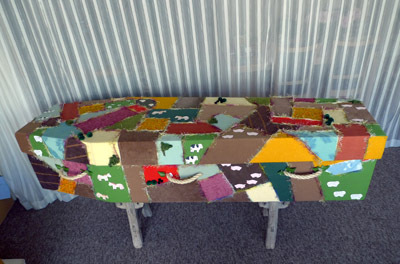 Panoramic View: This casket was designed for a weary traveller. Fascinated by panoramic views, she planned one day to make a patchwork quilt to reflect the beautiful countryside, but never got around to it. Ordered pre-need, this cardboard coffin provided the perfect canvas for a collage. Using her collection of fabrics and water-based glue I set to work turning brown corduroy into ploughed fields, gold felt into fields of corn and green towelling became lush meadows. Hedgerows are depicted using fluffy wool, felt animals decorate the fields and woollen balls represent solitary trees. Patchwork Denim: However tatty and frayed, he always wore jeans. This cardboard coffin reflects the personality of the person who ordered it. 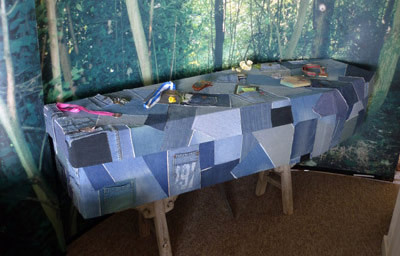 Covered with a patchwork of denim, the pieces are cut or torn into various shapes and attached using water-based glue. Pockets and belt loops provide ideal places for mourners to slip notes, photographs and flowers. Buttons, labels and any other interesting features were used to cover blemishes or where something didn’t quite fit! 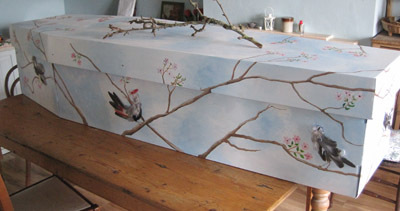 Birds and Blossom: This cardboard coffin was being used as a shop window display when it was chosen by a family whose loved one was passionate about birds. Painted in acrylics by Joanna Martin, it is embellished with delicate sprays of pear blossom and bird collages. The birds have been re-created using feathers collected while out walking with my dog, Poppy, plus the addition of a few exotic extras. The feathers are mounted on bird-shaped card using water-based glue and attached to the coffin with cardboard blocks so they stand proud. Family Affair: Mum’s eight great grandchildren, whose ages range between three and eighteen, provided the beautiful artwork that decorated her cardboard coffin. Nine year old Sam’s painting depicted a smiling person waving goodbye with the caption ‘I hope you are happy in heaven Great Gran.’ A collection of photographs that told the story of her life gave the finishing touches. 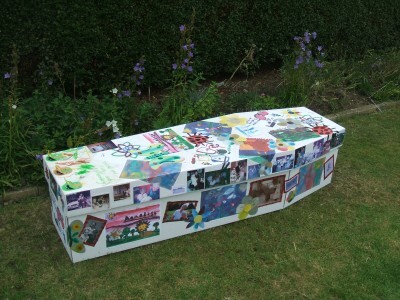 The coffin was then sprayed lightly with varnish just in case it rained on the day. Mum’s fingers always liked to be occupied, so we sent her on her way with a tangle of knitting wool to keep her busy, wearing her best dress and snuggled into a duvet. Cardboard: Available in white, dark green and, with a wood grain effect these coffins are made within a family business in Essex. Supplied with or without handles, they offer a perfect blank canvas for your own imaginative decoration: See above. The company also offer a pictorial design service personalising the coffin with your own choice of images: View gallery. English Willow: These coffins are hand-crafted using traditional and sustainable methods and are favoured for sound environmental reasons: View gallery. Natural Pine: Made from sustainable untreated pine these coffins are available in both traditional and casket shapes. They can be stained, painted in a colour or with your own design using water based paints: View gallery. Bamboo: Beautifully woven from sustainable bamboo grown under licence by a Fair Trade company. These coffins are made without the use of nails, screws or glue. View gallery. Pure Wool: These coffins are handmade in Yorkshire using pure new British wool supported by a strong recycled cardboard frame: View gallery. Leaf Cocoon Shroud: Crafted from hand-made felt, the leaf-shaped Bellacouche shroud fastens with toggles and is mounted on a sturdy felt covered wooden frame with six carrying handles: View gallery. Banana Leaf and Water Hyacinth: These coffins are suitable for cremation or burial. Both products grow abundantly and are sustainable making these coffins environmentally friendly: View gallery. Wine Rack: A sturdy piece of furniture in which to keep books and wine until required for use as a coffin.Simply remove the shelves and cover with the lid, which is stored at the back of the unit. View gallery. Cupboard: Used for storage purposes until required as a coffin. Simply remove the shelves and close the door. View gallery. Narrow Boat: A coffin crafted in the shape of a narrow boat made for a man who spent his life on the water: View gallery. Skip: A coffin constructed in the shape of a skip for a retired bricklayer with a sense of humour: View gallery. Union Jack: A range of flag themed coffins are available made from traditional timber with a personally designed wrap: View gallery. Coffins Covers for Cremation: A coffin cover is a temporary outer cover (a shell), which can be used to encase the actual coffin to be cremated. Following the funeral service and prior to the actual cremation process commencing, the coffin cover is removed in the Crematory and, when practical to do so, is returned to the funeral director. The remaining coffin and its contents are subsequently cremated: View gallery. Pebblewood: A coffin hand crafted from Birch Ply, is fully biodegradable and equally suited for traditional or woodland burials, or cremation and is lined in 100% natural linen: View gallery. D.I.Y: A coffin can be homemade providing that it is strong enough for the job. If it is to be used for cremation, check for guidelines with your local crematorium. Shrouds: A shroud may be used for burial providing the body shape is not obvious, so as not to offend people. Place the body on a board and swaddle it with cloth. This is probably the greenest option. Flat Pack: A flat pack coffin can be stored easily and assembled at the time of need.